She’s moved on… Felicity Knight loves New York. But when she spots her ex-husband in the city, Fliss is desperate to escape! He’s moved back… Vet Set Carlyle is back from California to establish his own practice and settle down. When he learns that his ex Fliss still lives close by, that future is looking a whole lot brighter… Will a perfect escape bring them back together? With the help of his adorable dog Lulu, and a sprinkling of beachside magic, Seth is determined to make Fliss see he’s never stopped loving her! We all know Sarah Morgan is my favourite author and has been for a good while now, so when i spied this on netgalley i requested it, but i was even more excited when it landed on my floor mat i was even more excited. We are heading back to the From Manhattan with Love series for this book, and as usual it was nice to learn more about the characters we had met in the other books. This time - We get to know Fliss. Fliss loves living in New York it is where she has made her home, but when finds out her Ex-Husband is back in the city, she flees - she doesnt want to bump into him, so when a family phone call comes along, and gives Fliss the perfect excuse to head to the coast for the summer - it can give her the perfect chance to escape. However what Fliss doesn't know, is that Seth also lives on the coast - its almost like fate was bringing them back together. Giving them the chance they should of had all them years ago. Visiting the hamptions makes for a wonderful summer break. As per usual the characters are warm loving and loyal. Holiday in the Hamptons is a story again of real life love, true friendship and family. 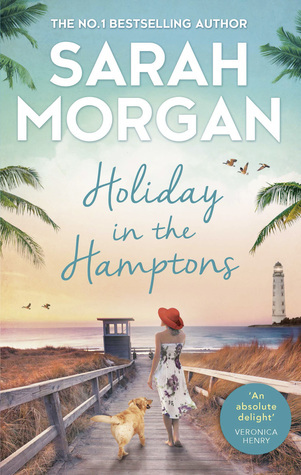 Sarah Morgan as usual has created a narrative that warms the soul, and makes you want to stop by for a visit with the characters, and i just - i love it. I love every book she writes because you just step into this world that is so true to real life that you almost struggle to separate imagination to truth. Its just wonderful and i feel like the narrative doesn't need to be explained, its just a story of how long true love has really lasted. You need to visit the Hamptons this summer! USA Today bestselling author Sarah Morgan writes contemporary romance and her trademark humour and sensuality have gained her fans across the globe. She has been nominated 5 times for the prestigious RITA® Award from the Romance Writers of America and has won the award twice. Sarah lives near London, England, and when she isn't reading or writing she loves being outdoors.